This B&H Kit lets you create a basic smartphone audio & video production rig. 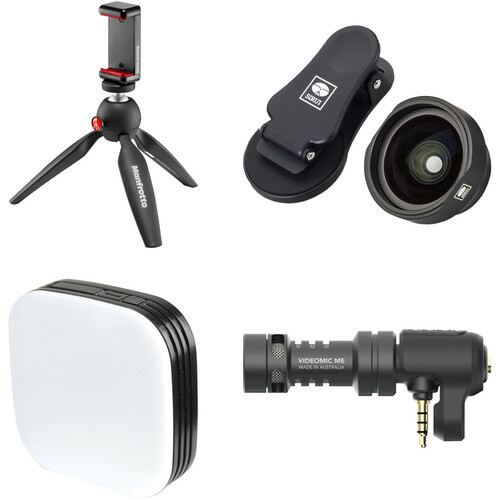 It combines the Manfrotto PIXI Smart Mini Tripod with Universal Smartphone Clamp with a black Sirui 18mm Wide-Angle Lens, a Godox LEDM32 Smartphone Mini Light, and a Rode VideoMic Me Directional Mic for Smartphones. Built using stainless steel, aluminum, and a technopolymer, the PIXI Smart Mini Tripod from Manfrotto includes a universal smartphone clamp with multiple 1/4" thread attachments, allowing it to be used with a wide variety of devices. The smartphone clamp can be removed, which enables the PIXI to be used as an ergonomic hand grip for videos, photos, and selfies. The PIXI can also be used with DSLRs up to 1.4 pounds and lenses with focal lengths up to 85mm. The PIXI's total supported weight is 2.2 pounds. Designed to bring more of the scene into each image, the black 18mm Wide-Angle Lens from Sirui converts the 29mm lens on most phones into an 18mm wide-angle lens with a 95° field of view, which allows users to capture more of their environment in their photos. This is especially useful for landscapes, architecture, and interior photography, as well as confined spaces and environments where the photographer may not be able to move further away from a subject when shooting it. This lens attaches to your mobile device by screwing into an included aluminum lens clip, which is then attached to your phone. To help ensure that the lens clip won't scratch your phone and that the lens won't slip, the clip's inside features a soft rubber lining. The lens clip can also be used with Sirui Mobile Phone Protective Cases or adapters. Additionally, an optional polarizing filter helps to reduce reflections and increase color saturation. Improve your low-light photography with the Godox LEDM32 Smartphone Mini Light. This light contains 32 LEDs and clips directly onto your smartphone to provide soft, even, diffused illumination for photos and videos. It puts out 120 lux of cool 5200K light from 1.6' away and has an adjustable brightness function, enabling you to reduce brightness down to 10% of maximum. Optically-controlled flash fire helps with sync and the internal battery lasts for up to 45 minutes on a charge and can be recharged using its micro-USB port. Please note that a micro-USB cable is not included. The VideoMic Me features a 3.5mm headphone jack on the rear that allows for play-through of audio while recording (app dependent) as well as easy playback of your videos without having to remove the mic. It includes a deluxe furry windshield for shooting outdoors or in adverse weather conditions. Box Dimensions (LxWxH) 14.75 x 9.3 x 3.2"
Box Dimensions (LxWxH) 3.3 x 3.0 x 2.9"
Box Dimensions (LxWxH) 4.9 x 3.3 x 1.2"
Box Dimensions (LxWxH) 7.4 x 5.1 x 2.6"